Joy Adamson was born Friederike Victoria Gessner on January 20, 1910, in Troppau, Silesia, Austria, to a wealthy Austrian family. Her parents, Victor and Traute Gessner, divorced when Joy was ten years old. Her father worked as an architect and town planner. Hunting was a favorite sport on her family's estate but, after she shot a deer with the estate's gamekeeper as a teenager, Joy promised herself she would never kill for sport again. Growing up, Joy dreamed of becoming a concert pianist, but her hands were too small. So she turned to such varied fields as psychoanalysis (the study of the mental process), archaeology, and painting. She finally decided on medicine, but never completed her studies. In 1935 Joy married Victor von Klarwill. Her new husband, a Jew, decided that the couple should move to Kenya to escape the rising Nazi movement in Austria. The Nazi movement started in Germany and aimed to "liquidate" or kill all Jews in Europe. Klarwill sent his young wife ahead to Africa. Unfortunately, on the voyage there, she met Peter Bally, a botanist (one who studies plants). When her husband arrived in Kenya, Joy announced her intention to divorce him. She married Bally shortly afterward, in 1938. Bally traveled through Kenya, studying its plant life, and Joy accompanied him. She began to paint their findings, and eventually completed seven hundred paintings that were published in several books. Within only a few years, however, there was a second divorce, closely followed in 1943 by a third and final marriage for Joy. She had met and fallen in love with George Adamson, a game warden in an outlying area of Kenya. The couple spent the rest of their lives traveling through the Kenyan wilderness together. George Adamson, as a game warden, often encountered lions and other wildlife during his travels. In 1956 he was forced to kill a lioness that attacked him while trying to protect her three cubs. Two of the cubs were sturdy enough to be sent to a zoo, but the Adamsons kept the third cub, a small female that they named Elsa. In her book, Born Free, Joy Adamson tells the story of how she and her husband raised the cub and then had to train it to fend for itself in the wilderness. After a great deal of work with Elsa, the Adamsons knew for certain that they had been successful when they left Elsa in the wild for a week and returned to find that she had killed a waterbuck, an African antelope. Elsa's story in Born Free ended with the news that the lioness had three cubs of her own. to become hunters. Eventually the cubs were released, but were never sighted again. All three "Elsa" books were extremely popular, and films were made of each of them—the 1966 Born Free was the most popular. The stars of the film series, Virginia McKenna and her husband Bill Travers, were so moved by the Adamsons' work that they later founded the Born Free Foundation in England to support wildlife conservation. It is estimated that the "Elsa" series and other Adamson books have been translated into at least thirty-five languages. According to Adrian House's biography, The Great Safari: The Lives of George and Joy Adamson, Born Free served as inspiration for zoologist Iain Douglas-Hamilton, a major activist working to protect the African elephant from extinction. House also notes that anthropologist Desmond Morris credits Born Free with affecting an entire generation's attitude towards animals. After Elsa's death and the release of her cubs, Adamson adopted a young cheetah, Pippa, who had been the house pet of a British army officer. For several years, Pippa was also trained to survive in the wild. Her story is told in Adamson's The Spotted Sphinx. Adamson also studied and worked with a variety of other animals, including baby elephants, buffaloes, and colobus monkeys. However, not all of the Adamsons' work with wildlife was successful. One lion that had been returned to the wilderness was destroyed after it returned to areas where humans lived, attacked a child, and killed one of the Adamsons' servants. As is still the case, preservation of African wildlife was a serious problem in the 1960s and the 1970s. The Kenyan government did not place a high priority on saving wildlife. Even in protected reserves poaching (illegal hunting for profit) was a common event. 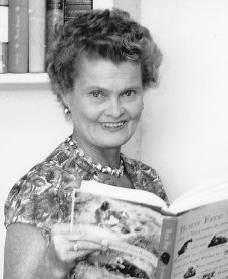 Adamson went on an international tour to speak about wildlife preservation in 1962, and became a founder of the World Wildlife Fund and the Elsa Wild Animal Appeal. The money earned from her books was used to set up animal reserves and to fund several preservation organizations. Adamson was also an early activist in the movement to boycott (to protest the selling and using of) clothing made from animal fur. On January 3, 1980, the world heard the shocking news that Joy Adamson had been killed in the Shaba Game Reserve in northern Kenya, where she had been observing leopard behavior. Even more shocking was the original explanation for Adamson's death—that she had been attacked by a lion. Her body had been found on a road near her camp in Mawson, and it quickly became apparent to George Adamson and the authorities that human forces were responsible. Her injuries were caused by stabs from a sword-like weapon, not by a lion's fangs and claws. Plus, her tent had been opened, and the contents of a trunk had been scattered. Although authorities eventually convicted someone for the murder, the true story behind Joy Adamson's death remains a mystery. A quiet funeral ceremony for Adamson was held near Nairobi, Kenya. Adamson had specified in her will that her ashes be buried in Elsa and Pippa's graves in the Meru Game Reserve. Her husband and several colleagues did just that. They took her ashes, divided them in half, and placed them in the graves of Adamson's two dear friends. George Adamson carried on his work alone after his wife's murder. On August 20, 1989, George Adamson was also killed in the Kenyan wilderness, along with two coworkers. The murders were blamed on several shifta, or bandit-poachers, who were roaming the area. Nevertheless, the work of Joy and George Adamson lives on, through the books that Joy wrote and the organizations she founded. Adamson, Joy. Born Free: A Lioness of Two Worlds. New York: Pantheon, 1960. House, Adrian. The Great Safari. New York: W. Morrow, 1993. Neimark, Anne E. Wild Heart. San Diego: Harcourt Brace, 1999. I love the book, "Born Free" its inspirational and I just absolutely love it!!!! !